This is the second and final part of the transcript of the conversation between Dr. Michael Congleton, MD, Ph. D, President of the South Pacific Region of the Sathya Sai Organisation, USA and Prof. G Venkataraman, eminent physicist and former Vice Chancellor of Sri Sathya Sai University. He told me several other things of a personal nature, and then we went back to the outer interview room. He continued seeing others, and when He was finished, He passed vibhuti out to everybody. 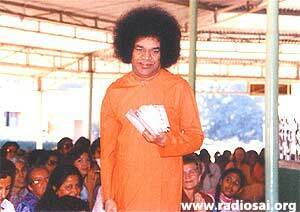 He carried a small basket full of vibhuti packets, and handed each person a handful of packets! I was the last person leaving the room, and someone had dropped a packet of the vibhuti, and as I reached down to pick it up, He laughed and said, “You want some more?” I turned around and said, “Sure!” So He gave me another big handful of vibhuti packets. The next morning, as I was leaving for Darshan, he was still asleep on the porch. I woke him up and said, “We need to go over for Darshan; Swami is coming out very soon.” And I left for darshan. I was lucky to get a seat on the front line in the darshan area, and I was sitting there, anxious about what Swami had meant when He said: ‘Be prepared.’ I thought that Swami might do something in the darshan area, so, I asked someone sitting near me to take a picture if anything happens. At that time, you could carry a camera into the darshan area. As Swami passed by me during darshan, He said: “Go!” So I went to the waiting area outside His residence. As I turned the corner to join the other devotees in the waiting area who had been picked for an interview, I saw the Australian cowboy and his mother standing there with the other devotees! Swami had also picked them out for an interview. 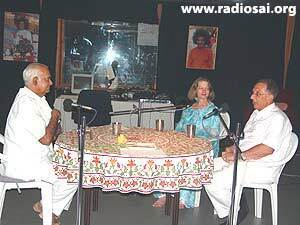 Everyone went into the interview room, and Swami said something to them immediately. He called him back for a private interview. When they were out, He motioned for me to come forward and gave Him that quartz egg I had been carrying. He took the quartz egg, held it up for everyone to see, and asked the group, “What is this?” He held it up so everyone could see it, but nobody answered Him. He then said, “This is glass; it’s only glass. 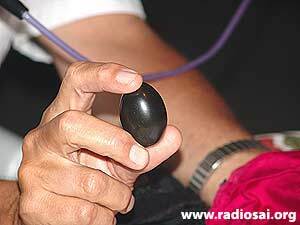 I am going to make a real Shivalingam.” And He put the quartz egg into the palm of His right hand and held His hand, palm up, for everyone to see. He gently blew on it several times without moving His hand. 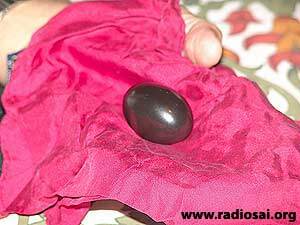 It transformed from a reticulated quartz egg into a solid black Shivalingam! He held it up and said: “This is a real Shivalingam.” He continued, “It is made of the five elements.” He stopped and looked at me asking, “Who does this belong to?” I looked up to Him and said, “To You, Swami.” He smiled, nodded yes, and pulled a silk handkerchief out of my pocket. He wrapped the Shivalingam in the silk handkerchief and put it in my shirt pocket. He then said to me, “Put it in water every night, and it will help calm your mind.” I have been carrying His Shivalingam with me for twenty years, and I have put it in water every night. The Shivalingam is on loan from Swami. It still belongs to Swami. Many nights, when I take it from the silk handkerchief to put it in water, I wonder, “Is it still here or did Swami take it back?” I believe He is beyond space and time, and His reach is unlimited. During the last twenty years, I have traveled over 2 million miles on job related trips and vacations, and the Shivalingam has always traveled with me. In fact, it is with me today. Prof. Venkataraman (GV): Maybe we can take a look at it. GV: Can I ask you a question? Was the glass piece that you were having, of the same size or is this bigger? MC: I have been asked that question before. I can’t say if it is the same size or if it’s smaller or bigger. I can say that it’s about the same size. Swami has unlimited power, and He can create what He wants, when He wants. I believe He can transform His creation and His created as He wills. GV: Oh yes! You must have heard the story of Jack Hislop’s cross? MC: Yes, I am fortunate to have known him very well. MC: Yes. In fact, he let me hold that cross and examine it closely. 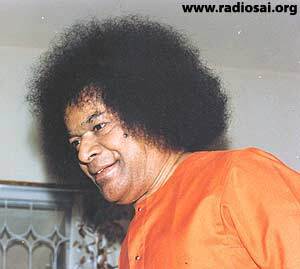 Swami reconstituted the wood for the cross from the True Cross on which Christ was crucified. It had dissolved into its basic elements, and Swami pulled the dissolved elements back together to make the cross He gave to Jack. 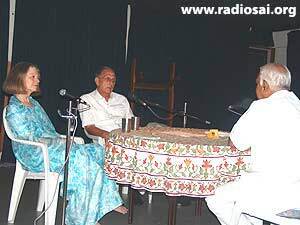 GV: Since you mentioned about the Shivalingam and your pocket, would you mind if I narrate a short story? Normally, what He used to do was He would get into the car and go in the opposite direction of the traffic! The traffic would go towards Bangalore and He would go away, so that the crowd melts and then He would go back to the ashram. The Discourse was in the College Auditorium. 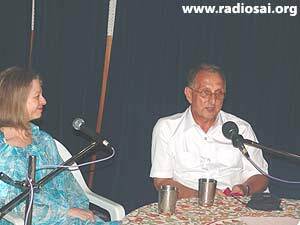 He got into the car and Professor Sampat was sitting in the front, next to the driver and Swami was sitting at the back. After they went for some distance, He said, “Sampat! 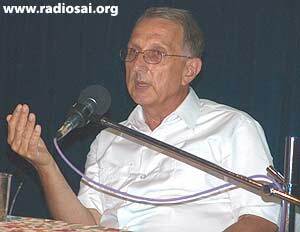 I gave you a lingam, now I want you to give it back to Me.” And Professor Sampat put his hand in his pocket and he couldn’t find it! And he began to sweat like anything! GV: He was muttering and stuttering; he didn’t know what to do! Swami said: “I want the lingam back! I told you; didn’t you hear Me?” And he said, “I am trying to get that Swami!” Swami said: “What do you mean you are trying to get that? 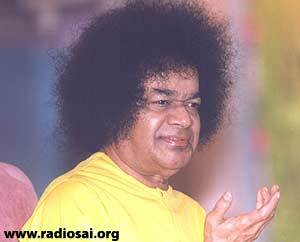 You have to just pull it out of your pocket and give it to Me!” Then he said, “Swami, I think it might have fallen down in the car.” And he began to look on the floor of the car and Swami said, “You are very careless! I told you it was very precious; what on earth is going on? Why did I make you the Vice-Chancellor?” Of course He was just pulling his leg! And Sampat was just panic-stricken! He wished he was probably at the end of the world somewhere – the North Pole or the South Pole! Then Swami said, “Don’t worry! It is too precious to be with you; so I have already taken it away from you!” This man finally came back to normal! So this has happened; sometimes He doesn’t want it to be with a human, sometimes He just allows them to look and not touch. So there have been various such instances. GV: Sometimes He gives it away; but with regard to the lingam, I have heard many people being given the same instruction – do oblations with water to it, and then drink that water. There is an old student of ours - alumna of the Anantapur College - she is the daughter of a Doctor from Sri Lanka who works in our Hospital here. She studied many years ago, got married to another Sri Lankan and they both settled in New Zealand, because now he works for the United Nations and they are in Cypress. 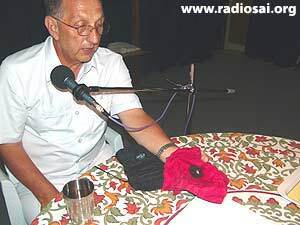 I have been to their house in New Zealand, and Swami had given her a lingam like this. She used to meditate and pour water over it and drink it. Her husband had a colleague who was a New Zealander, a Kiwi, who had some incurable disease. He tried everything and nothing worked and he was in frightening pain. He said, “Look! I don’t know what to do! I want to commit suicide!” or something like that; he was in a real desperate state. Then this man said, “If you have tried everything; I suggest one more thing. Are you willing to try it?” “I am ready for anything! I am desperate!” He replied. But this man again said, “You must have faith.” “What’s that?” He said. Then this man said, “I will give you some water everyday, you have to drink it.” He said, “Okay, I will try.” And within a week or few days, that fellow’s pain began to go down and pretty soon he got cured - because he was willing to have faith. So there are many such stories. GV: Have you had any sort of out-of-the-ordinary experiences on account of this lingam that has saved you from any calamity? MC: Well, probably many times I have been saved. GV: Is that right? I want you to share at least one experience. MC: I have carried this lingam with me wherever I have traveled, and I have traveled a lot as I mentioned. As a result of so much traveling, I am exposed to a lot of unstable situations and I have come through those situations with flying colours! GV: You mean, while traveling with the Navy? MC: In my travel with the Navy and in my travel as a healthcare professional with the company I worked for. When I left the Navy, I was recruited by a company to help manage some of their large healthcare projects. One of the projects was to create a large hospital information system which has become one of the largest hospitals information systems in the world today. As a result of my working in the hospital automation business, I traveled around the world, briefing some Ministries of Health about the value of moving from manual, paper-based medical records to automated electronic medical records. In the process of traveling a lot, one goes through many airports catching connecting flights, and once when I was traveling through the Frankfurt airport, the German Police created a barricade in the middle of the airport. Swami has saved me, and He has saved all of us before on many occasions. An example is the experience my wife and daughter-in-law had during their recent trip here (to Puttaparthi) a week ago. During their trip, when they were in Heathrow Airport just last week, there was a bomb scare and the authorities closed the airport. The authorities evacuated about 3,000 people, including my wife and daughter-in-law from the airport terminal to the airport parking lot. They announced that all the flights to Europe had been cancelled, and all the long haul flights had also been cancelled. My wife and daughter-in-law started to worry that they might not be able continue their trip to Bangalore. The authorities said that only those passengers on flights that were announced could return to the airport. They also learned that their flight to Bangalore had not been cancelled. They had been listening very closely for the announcement of their flight for several hours. GV: Was this man an Indian? He then helped guide them up through the packed mass of people to the front door of the terminal. As they entered the terminal, they turned around to thank him, and he had disappeared! They looked for him on the plane to Bangalore when they got on board; he was not on the plane; he didn’t fly to Bangalore. GV: Andy’s job had been done! MC: Yes, that’s what I was thinking – Andy? I think he really said ‘Handy’!’ This definitely was Swami’s doing! Thank you, Swami! These miracles happen in our daily lives, and most of the time we take it for granted! Many times in our lives, someone has unexpectedly helped us, and I think that many times, Swami has prompted that to happen. 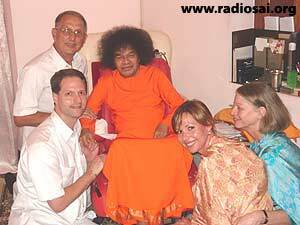 To tell you the truth; many times I think that it is Swami who is actually doing the helping! GV: No question about it! He always says 'I come in so many Forms'. GV: I am sure you have read the famous story of Tolstoy – ‘Martin the Cobbler’. Have you read that? GV: It was one of my favourite stories. It’s about a Russian cobbler; and it is a cold wintry day, the previous night he had a vision. Christ says: “Martin, tomorrow I will come.” So he is all very anxious to welcome Christ. The first thing that happens after he gets up in the morning is that a little later, a young boy comes – hungry and cold. He gives him some tea and some bread. Sometime later, a young lady comes – cold and shivering with a small baby. He accommodates them, makes them sit near the stove, and pours out some tea and something else for the kid. So, the Lord does come in many different ways; there is no question about it! It is a beautiful story and it conveys the same truth that Lord comes in many Forms; but we don’t recognize it. MC: Yes, yes, it really is true! GV: I now want to ask you a couple of quick questions, before I let you go - as they say in American shows. The first question is: Did you have any difficulty in reconciling Swami with all your scientific background? Because you know, your background trains you for a certain point of view; especially if you come from hard-core physics, which I have also done. MC: Yes. Well, let me back-step a little bit to my physics training then. 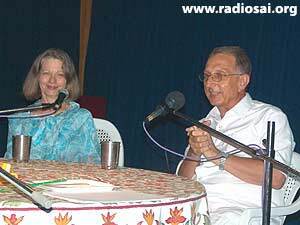 MC: Swami helped prepare me for things a bit out of the ordinary from a scientific perspective. When I was a graduate student in physics, I worked on an advanced degree experimental physics. I built most of my experimental equipment, and I built my own high vacuum glassware. I really liked experimental physics. One afternoon my major professor came and told me he had a graduate student coming from China who would be working on her Master’s degree and he wanted me to help her set up her lab equipment for the experiment. During our meeting, the graduate student from China said, “I want to prove that plants have feelings.” At the time, as a pure scientist, you can imagine how that struck me. GV: You thought she had gone bananas? MC: Yes! I thought: ‘What am I getting into? How did he accept her as a Master’s degree student?’ In spite of my doubts, I agreed to help her set up her experiment. I hooked up some sensory equipment to the root systems of her plants, and I showed her how to operate the equipment. Once again, I strongly threatened the plants again (to rip apart, burn, and throw away). However, the meter readings were much lower than before. I tried again, and this time, the meter readings did not change. Now I was asking myself, ‘I wonder if they realize I was bluffing?’ This experience made me start considering that there must be something beyond the purely physical. GV: Have you heard about these experiments of Robert Jahn in Princeton ? Then he thought: ‘Let me give it a try.’ And he had a random number generator which would give a normal distribution. And then he had volunteers to go and sort of focus on the machine and say: ‘No, you don’t behave randomly; you don’t behave randomly.’ Or something like that and they began to give distributions that were away from the normal random Gaussian distribution. And then he said, “This can’t be true! I don’t believe this.” And so he tightened his controls and so on. Ultimately he ended up setting up a whole laboratory and spending two years and he even wrote the ‘Quantum Theory of Consciousness’ papers on that. He was a Princeton man, now he is pretty old. But he published some of these in the Proceedings of the IEEE which is a pure science journal. Of course, many people said that it is junk science. But you know, he was a thoroughbred Princeton Professor, not to be sneered at. So I think people who didn’t want to believe him, dismissed him. I am reminded of Dr. Krucoff who was from Durham Medical Center and who had come to Swami. He did some experiments on patients; of course, it was with controls and all that. And one set of patients would be prayed for, in different places – in Jerusalem, in some Buddhist monastery in Tibet, and some Muslim group in Turkey or something like that, and some group in Washington and so on. And they got cured better than another group. So, the long and short of it is, there is a possibility of this telepathic thing. You have heard Hislop describe his experience anytime? The sari’s crying? GV: You heard that. So that was an extreme case which Swami enacted just to make Hislop realize that even inanimate matter has a bit of consciousness; it is not completely free. But, talking of inert mater and everything else, that is born of inert matter coming from consciousness, the most powerful statement I read was of George Walt who got a Nobel prize for medicines for his investigations with the eye – something to do with the way the eye works and so forth. And it’s rather interesting that Freeman Dyson, whom you must have heard of, did all this fabulous work in Quantum Electro Dynamics and then of course, he sold his soul to the devil as he described it. He worked in Los Alamos making the hydrogen bombs. He, as a McArthur fellow, wrote several papers in the Reviews of Modern Physics on: ‘Life without flesh and blood’ - consciousness existing all by itself on the Universe, that is, when the planets become too hostile to support life of this form, and so on; it is very serious stuff. Of course, he does a lot of calculations and all that. So when I read all that and the fact that Schrödinger read Vedanta and believed in the Atma, I felt that there is something much beyond what we normally deal with and it is too immature to be skeptical about these things. MC: Yes, I definitely have come to believe in the same thing that if we follow Swami’s teachings, we can experience our spirituality more. GV: What aspect of Swami’s teachings appeals to you most? MC: To love Him above all, and to love our fellow man as our self; these are the most meaningful. GV: There are lots of people who don’t believe that love is going to work. This is an age of violence, you see violence everywhere – violence is the only answer. MC: If you look at the results, you will see that that’s not true – violence begets violence. GV: Supposing somebody asks you: “Come on, don’t tell me that you can transform people with love!” What would your reply be? GV: Do you know of any example where love has triumphed over reasonably at least? 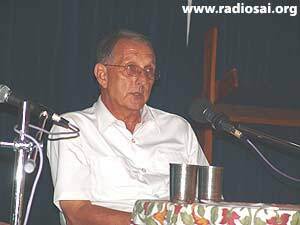 MC: Well, Gandhi – non-violence and love! GV: No, anybody you know from a little personal experience? Has Hislop or Sandweiss or Hal Honig or anybody else told you of any experience? MC: I know a story of a man I was talking to recently - Dr. Upadhya. GV: He is an Ophthalmologist in UK. MC: Yes. He was saying that he had gone to Bosnia. And while he was there, they had trucks full of medical and other supplies they needed to get to the refugee camps to save lives. But the problem was that in order to get the trucks to the camps, they had to drive through a very hostile territory. There was a high probability that the driver and the truck would not make it. They couldn’t get anyone to volunteer to drive the trucks. The man said, “Yes, I will do that. I will drive the supplies.” So, he got into the truck, took off, made it to the villages, and started distributing the supplies. The recipients of the supplies were overwhelmed with joy because of his arrival and they showered him with their gratitude and love! This experience transformed him! He changed from someone who was ready to end his life into a loving, caring person who practices active love, two hands selflessly serving those in need. He continues to carry needed supplies all over that country into and through hostile territories. He has became very well-known by the authorities, and he is the one man who can go anywhere in that country. GV: You mean, he keeps on doing it. MC: Yes, he keeps on doing it and the people in charge, even though they disagree with each other, see the need to help their own and to allow him to come and do his work. I think it’s the expression of the love of those people to him that transformed him. I believe the same thing can happen too when you have an outpouring of love. That love transforms whoever you are interacting with. GV: But this is a very interesting thing. A man, who wanted to end his life, put it off, took to loving service, and has changed his life. GV: That’s a very striking example. I wish we could get more people to know about these things and turn away from desperation to something more constructive and positive, and if more people become oriented towards positive work, and positive thinking and they connect, then there can be a groundswell and that can produce a change. So that’s a very nice thing to hear. MC: And you know, it’s just as Swami teaches - desires result in frustration and anger. MC: And the satisfying of desires never brings true happiness – especially in the material world. In my experience, the more that I get, the harder it is for me to keep everything repaired. MC: Like Swami said, “The lighter the luggage, the more pleasant the trip.” So, I am trying to do that, to lead a simple life. It’s a lot happier life. GV: Once I went with Swami to Bombay. And the host gave all of us a small brief-case like thing. And Swami handed it out to all the people in the party and there were about 6 or 7 of us; I was one of them and I looked at Swami and said, “Swami, You say less luggage, and You are giving me luggage!” He said, “I didn’t mean this kind of luggage!” Because He wanted to get rid of it, He gave it to me! So He said I didn’t mean this luggage. That was a good one! So, I would like to thank you, I have kept you here for more than an hour almost. It was a pleasure. Your son is missing but next time we will have all three of you. MC: He attended Summer Showers in ’95, he has been an active young adult, and he will have a lot to talk about it. GV: Yes, we will take a shot at you – not with the guns, but with the cameras, not just the microphone – all three of you. You said you wanted to prepare, you have 6-7 months ahead to prepare with notes and get ready for a stiff examination. MC: I will do that! Thanks for the invitation; it was a pleasure being here. GV: No, it was my pleasure. Are you going on Wednesday? GV: Well, have a nice trip back home, and thanks for spending some time with us. MC: Thank you and we look forward to seeing you when we come back here for Christmas! GV: Sure, Thank you. Sairam!